Ok, so I was planning on keeping life in general seperate from this blog and put it on another–turns out I am busy, and trying to manage three blogs is not too easy. I only have the third one set up…haven’t even written for it yet! Lots of life changes have been happening here. It has been one thing after another–it seems that I am trying to cram all the things that are supposed to happen over the course of about 10 years into about a month and a half. 🙂 Seems like I am joking, but really, very serious. So I’ll try to start at the somewhat beginning. I had a lousy marriage before. I tried my hardest to make it work, tried to pretend it was all wonderful and would eventually work itself out. Everyone said the first year is always the hardest, but four years…it was a bit much, and only getting worse. Last December, as posted before, I left and divorced him. It did break my heart because I would (and do) miss my stepsons, despite the problems that we had. My ex actually was quite understanding on why I left, and we did end up going through the divorce as easily as could be expected. We agreed that we would be fine with the other dating before the divorce was finalized, which is where the next big step happened. I had moved in with my grandfather to help take care of him. Over the Christmas break (work at the university meant we had two weeks off), I was up late watching TV often. One night I saw the eHarmony commercial, and normally would roll my eyes, but this time I thought about it and signed up for three months. Two weeks later, I met my hubby-to-be. Dan and I went thru the whole eHarmony process, then we emailed, talked all night on the phone many nights, and then met–already in love. Everyone who met him and saw us together knew we were meant to be. We moved in together at the end of Feb, and started planning out our future. We decided to get married in May, after my college graduation–yet another huge accomplishment that happened. On May 6, his parents came in from Colorado to take care of the dogs while we went on a weekend getaway from May 7-9th. It was wonderful–a beautiful bed and breakfast, a helicopter ride, and him proposing to me. 😀 It was perfect! May 14th I graduated from college with my BAAS in Psychology, Sociology, and Social Work. Backing up a little…I had left my job at the UPD at the beginning of March when I had to choose between my job and school. Obviously school won out–I was in my internship, which also happened to be at the UPD. It was a bit, uh, strange, but I got through it. I was happy and scared–I had been in school for 13 years, and now I didn’t know what to do. After talking about it, we decided I would start my own business consulting others on sexual assault, domestic violence, and child abuse, plus a few other topics that are related. Then it was time for the wedding…five days after my graduation. It was awesome…we got married in a cave with only 16 people there, including us and the JP. We decided to take the tour as well, so we did the educational thing on the way to the back of the cave, stopped, got married, then came back out of the cave. After we all had dinner at a restaurant, new hubby and I took a mini-honeymoon for three days about 2 hours away from us, and then came back. For those who have read my blog before, they know what a rollercoaster I went through with my ex. So many can understand just how excited I was when I took the six pregnancy tests and saw them all pop up PREGNANT!! I wasn’t supposed to be able to conceive without the assistance of drugs and IVF, so this was the most amazing surprise! We had already been looking at adoption since we had gotten married, both of us accepting that we would most likely not have a child of our own. I am thrilled, he is thrilled, and our life has been turned upside down–or at least mine. Why? Because it was over the vacation that we left for to visit Colorado–the 18th thru the 26th–I really began to show. I packed for the trip a day before we left, and even tho I had put on a little over 10 lbs since we conceived, all my clothes fit (I thought). My weight has always fluctuated in a 10 lb range. However, this time things are different…I am going straight out, not equal at all angles. So we had to go to get some clothes for me to wear a few days into the trip since nothing fit anymore. Then, like most pregnant women, there are the wonderful mood swings–my tolerance for people picking on me has gotten to be extremely short. This was a key factor in my mother and I not getting along for a lot of the trip, as well as since I have been home. 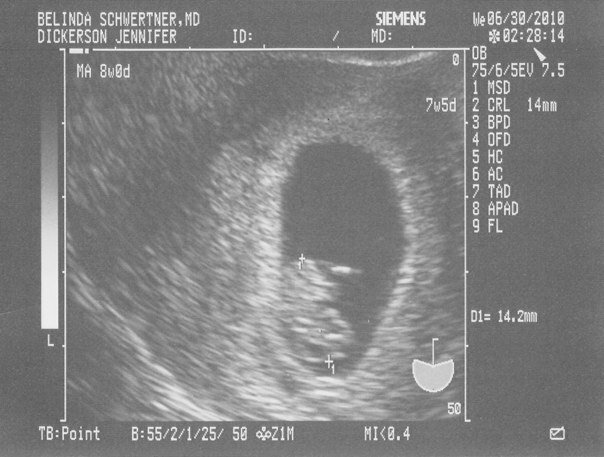 Oh–I am 8 weeks along, and due on Febuary 9! Wow! What a year you’ve had. We are so happy to hear that you and your husband met on eHarmony and that you’re now expecting your first child in February. Congratulations! If you haven’t already done so, we would love for you to share your amazing story and photos on our Facebook page, http://www.facebook.com/eharmony , and with our Success Stories team: http://www.eharmony.com/stories.